Wood's Rum Boat, one of the best summer pop-ups of last year, is back for July and August 2018, first in Hackney Wick (until 25th July), then in King's Cross, and then back to Hackney Wick over the Carnival weekend. Go for cocktails at Number 90 Bar & Kitchen, or, from 7pm each night go for an hour-long cruise - with free cocktail - for just £15. Hurry - some of the dates for cruises are getting sold out. "Raise a ‘tot’ to the warm weather with the return of the Wood's Rum Boat! Enjoy an hour-long tour on board the Wood’s barge. Tickets include a tour and complimentary Wood’s cocktail. 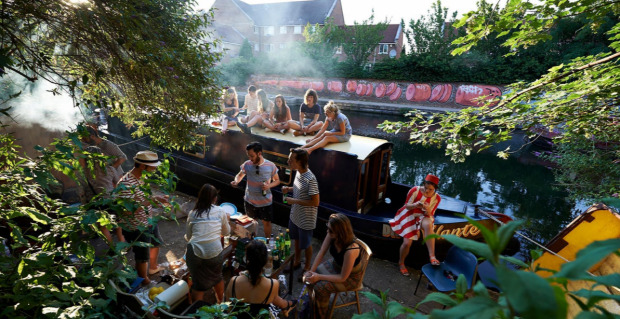 From 2nd July – 27th August, Wood’s in conjunction with Ladies & Gentlemen bar, will be cruising across London in their very own working barge. We will be moored at Bar 90 Bar & Restaurant from Monday 2nd July until Wednesday 25th July and then we will set sail to Granary Square, Kings Cross where we will be moored up from Thursday 26th July until Wednesday 22nd August with a return to Bar 90 Bar & Restaurant for a special closing party! Nestled in the heart of the East End within the flourishing cultural landscape of Hackney Wick, Number 90 is a stunning, spacious canal side bar and restaurant." When - In Hackney Wick til 25th July, then in King's Cross, then back to Hackney Wick from 23rd August.